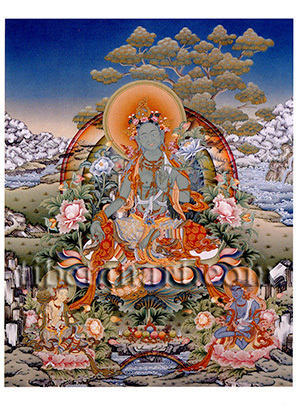 Khadiravani Tara, or 'Tara of the acacia forest', is shown here with were her two bodhisattva attendants, Marici and Ekajata, who appear at her lower right and left sides. Marici (Tib: Od-zer Can-ma), meaning 'the goddess of light rays', holds the attribute of a flowering branch of the ashoka tree (Saraca Indica) in her right hand. And the semi-wrathful blue goddess Ekajata (Tib: Ral Chig-ma), meaning 'the single hair-lock', holds the attribute of a nectar-filled skull-cup in her left hand. Khadiravani Tara sits in a posture of royal-ease upon a white moon disc and a multicoloured lotus, with her left foot drawn up and her extended right foot resting upon a small lotus pedestal. She is beautiful and youthful, green in colour, and wears all manner of divine silk garments and jewel ornaments. Her right hand rests upon her knee in the boon-granting varada-mudra, symbolizing that she bestows liberation upon all beings. Her left hand is held in front of her heart in the gesture of granting refuge or protection, symbolizing that she protects all beings from the 'eight great fears', which are: fear of thieves (false views); snakes (jealousy); fire (anger); lions (pride); elephants (ignorance); drowning (attachment); demons (doubt), and imprisonment (greed). With both hands she holds the stems of a blue utpala lotus, each of which blossom at the level of her shoulders. She abides amidst a tranquil landscape of rocks, clouds, mountains, lakes and flowers, and behind her throne ascends the branched canopy of an acacia (khadira) tree.